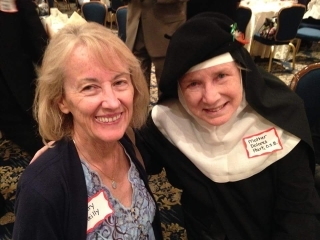 For our July shows, Carolina Catholic had the privilege of meeting and interviewing Mother Dolores Hart from the Abbey of Regina Laudis in Bethlehem, CT, and her assistant, Judith Pinco, a singer and a convert to Catholicism who is now Mother’s assistant. In the first show, we talked with Mother about her career in Hollywood in films like Loving You and King Creole with Elvis Presley and what led her to abandon her acting career and embrace the monastic life at the Abbey. In our second show, we interview Judith Pinco about her career in the music industry, her days as a hippie and a Hindu, and the circuitous path she took to find her way to the Catholic faith and the Eucharist.